Jacques Defrance is a small family run Grower Producer in Les Riceys, a commune in the heart of the Aube district in Southern Champagne. The family has been growing grapes for 4 generations now, and the wines are not well known nor is much information available about them online. Interestingly perhaps, Marks and Spencer, a major British luxury clothing and food retailer, carries their Brut. They grow only Chardonnay and Pinot Noir, and along with Champagne make a well regarded still Rose. Riceys is barely 3 square miles, and less than 5 miles from Chablis. 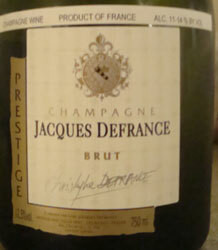 In great year Jacques Defrance may make 100,000 bottles of wine, 95% Champagne. Any info is hard to confirm, as their Website is currently essentially dysfunctional and they are having a new one built. Update: Website much improved! Check out the video at the bottom too! 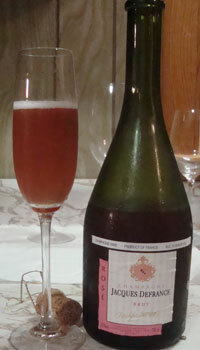 Rosé des Riceys - a still rose wine that supposedly ages phenomenally well, 40+ years in good vintages. The cork really did not want to come out of this bottle. It took pliers and a few minutes! Bottle claims Chardonnay dominated, Marks and Spencer says 80% Pinot Noir. My palate says Pinot Noir dominated. The nose is minerals and chalk. Definite tinge of cherry as it warmed, no doubt due to the high Pinot Noir percentage. In the mouth it is masculine with plenty of minerals and grip, and lemons/oranges. A little pineapple as it breathed, which is not unusual for wines from The Aube. This is a steal at the $32 I paid. A very nice wine! Imported by Premier Cru of Oakland California, one of my favorite wine retailers, who also imports their slightly more expensive Brut. The rich deep pinkish red color is immediately noticeable and impressive. Lots of fine bubbles. The nose is full of minerals and chalk and very fresh. Maybe a touch of fresh peach. A lovely nose. On the palate this screams "red" and "fresh" and is surprisingly sweet and supple. Raspberries. A good deal at $30, It's quite enjoyable but doesn't have much complexity. A fun rose.